Getting started riding a bike can be very nerve wracking, especially for women. Lots of women find themselves unsure riders when they first start out. Mastering the open road is pretty straightforward, but for many women, riding through traffic in town can be pretty harrowing. 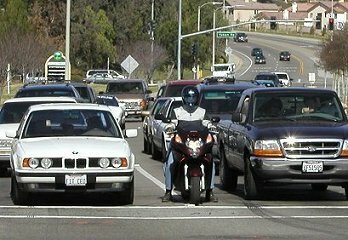 Here are some basic tips for riding in traffic. You never know when you will need to stop when you're riding through traffic and often, you will have very little warning! Keep one or two fingers on the brake lever, ready to go. Keep your toe near the brake pedal as well, on the alert for when you might need to stop. This is something you should do all the time while you're in traffic, not just when you're learning to ride. This is just good, defensive riding. Watch the cars around you, especially the one right in front of you. Watch the driver and see where he's looking. Check the mirrors of the car in front of you as well. The driver might not check his mirrors before he makes an unanticipated move, but if he does, you'll see him either check is mirrors or move his head. You want to be noticed when you're on the road. This is especially important for women, who typically ride smaller bikes. You don't want to slink off to the side and try to stay out of everyone's way. You want to be a presence on the road. Wear loud colors. Put your high beams on all the time. Go so far as to rev your engine every now and then - not to be obnoxious, but to let people who might not be paying too much attention know you're there. You want to scan your instruments, your mirrors, your blind spots, and the rest of the road on a regular basis. It is easy to get hypnotized by the road, or to get fixated on watching the guy ahead of you. Actively press yourself to scan the entire area, starting with your bike and working your way around the area. Take a look at your blind spots on a regular basis. Take note of the cars around you. Notice when they turn off and who comes in to take their place. Always be aware of your out when you're driving in traffic. Do not let yourself get in a situation where you don't have at least two ways out - and know what they are! It can be easy, when you're driving in traffic, to get caught in a situation before you know it's happening. Try to stay alert and to be aware. Actively talk through (in your head) two ways out of where ever you are. As if you don't have enough to do already, you do need to pay careful attention to the road in front of you. Watch for anything that's slippery, such as oil or antifreeze. If you see any suspicious patch up ahead, do your best to avoid it. Be aware of the type of road you're riding on, concrete or asphalt. Look for cracks or potholes and avoid them as well. Learning to be a defensive driver on a bike is one of the most important skills you can master. This is especially important when you're driving in heavy traffic. Be cautious, be safe, and stay alive.